Home » Collections & Research » Museum Collections » George Hoshida Collection » 11-8-43, 9:05 PM S.F. 3 drawings on paper (1 sheet) : ink ; 9.5 x 6 in. 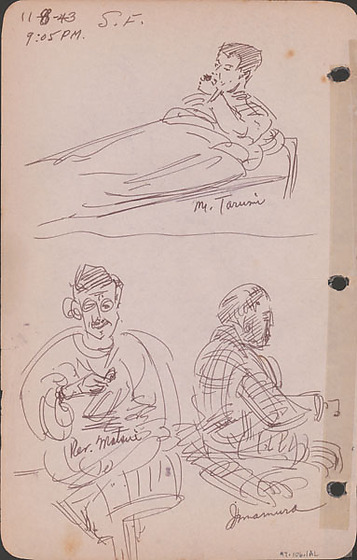 Ink sketches of a man in bed and two men sitting, all identified by inscriptions. Top sketch of Mr. Tarumi reclining and apparently eating something with his left hand. Bottom left image of Reverend Matsui seated facing viewer holding something in his right hand. Bottom right sketch of Imamura seated facing right in profile. Drawing 97.106.1AK on recto of same sheet. Written in black ink, top left corner: 11-8-43 S.F. / 9:05 PM Written in black ink, below top image: Mr. Tarumi. Written in black ink on bottom left image: Rev. Matsui. Written in black ink, below bottom right image: Imamura.